The third installation of the evening was Crystal. 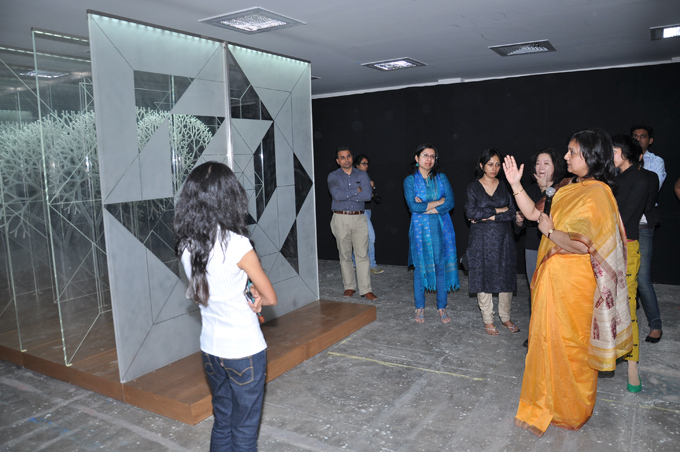 Speakers Anthony Lopez, CEO and Primary Designer at Lopez Design, and Banhi Jha, Dean of the National Institute for Fashion Technology (NIFT), noted Crystal was distinctive from the previous installations due to its order, transparency, symmetry, and strictly planned design. Its white and clear linear design imbued it with a sense of purity and perfection. Its design is simple, yet complex, forcing participants to think deeply about its meaning. 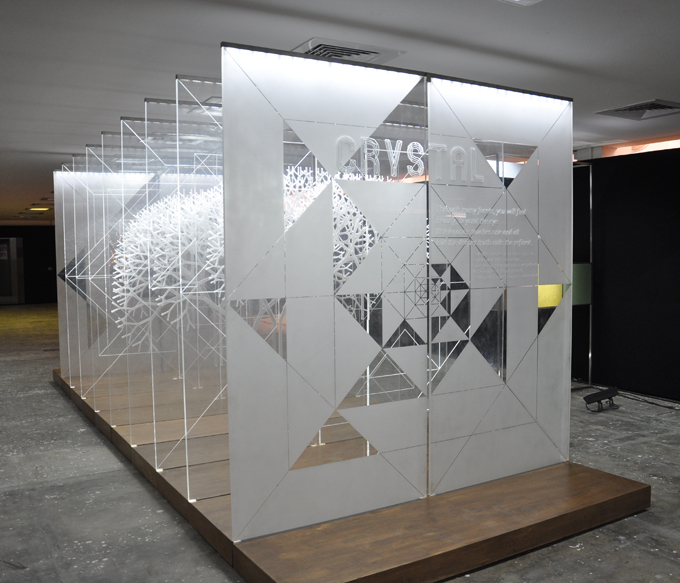 Many participants felt a connection with spirituality, infinity, or the journey of the afterlife.The symmetry, transparency, and light hues give Crystal and ethereal feel instigated a philosophical journey, a meditative and reflective appreciation of its design. Others saw Crystal as a relational piece. 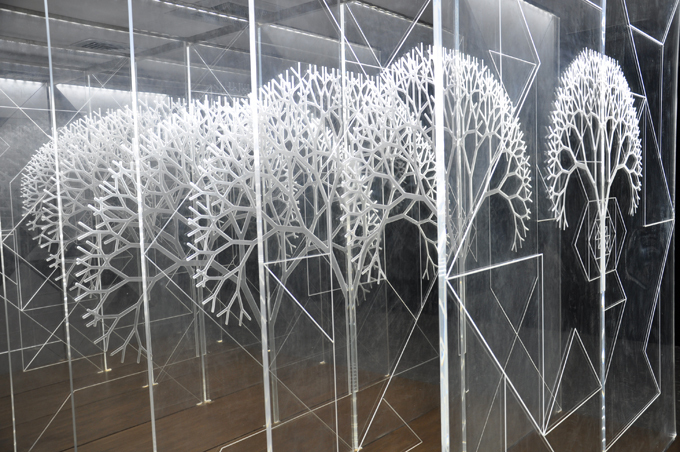 Participants noted the harmony and symmetry of the installation as representative of the interconnected nature of people and nature. Others brought up the layered nature of the installation, and the masks people wear that cover their true natures. Ram, from Trapeze design, who was involved in the creation of the installations, explained that at one level, crystal is pure and simple beauty. On another, it is complex, multi-layered, and composed of overlapping and interpenetrating elements. It is a demonstration that society today is more accepting of complexity and even contradictory facets of life, as well as individual complexity. 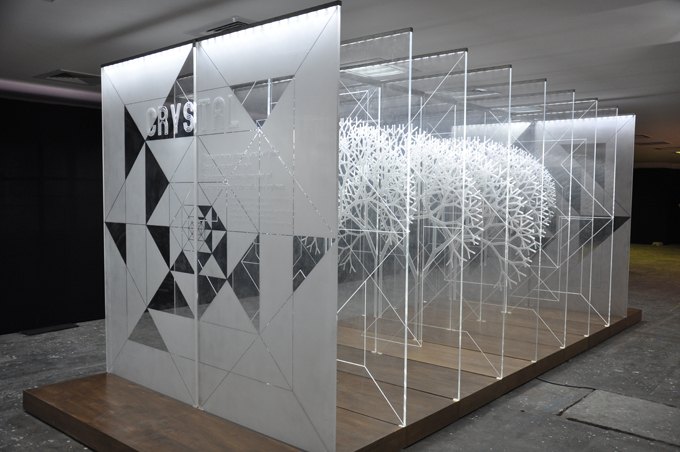 Crystal is an exercise in perspective, a transcending of culture in search of a human experience. 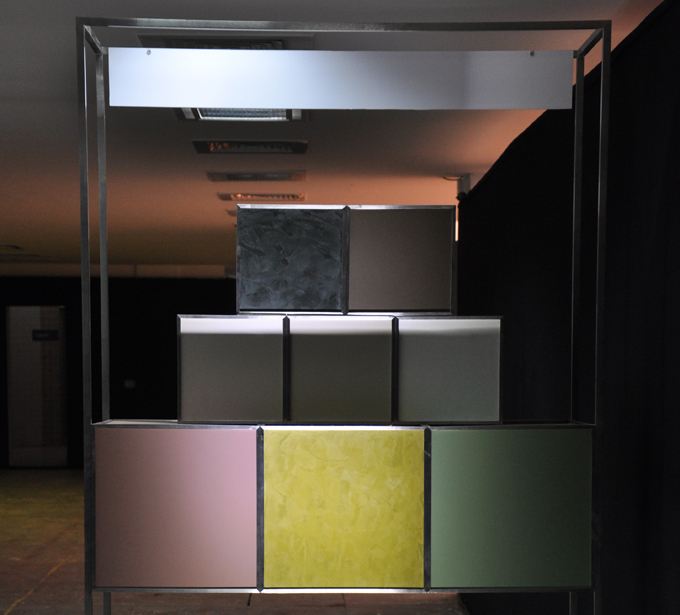 Nien Siao explained that the colours for crystal were inspired by the different strata, the layers, of the earth. The neutral and textured hues overlapped to create a clean complexity. Some participants resonated with the misty tones, and described a sense of serenity, purity, and peace that transcended physicality. Others, looking for more vibrance, thought the palette too muted and dull.